1) Open up your new Signature directly in your Chrome Browser. 2) With your cursor, highlight to select your entire signature. 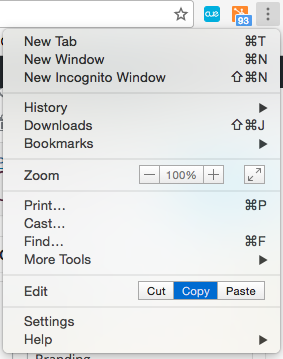 3) Next, go up and click on the 3 horizontal lines or dots in the top right hand corner of Google Chrome. This will drop down a menu and you will see under the Edit Category an area to select “Copy”. This will ensure that you have copied all of the images and code correctly! 1) Open up your new Signature directly in your Firefox Browser. 3) Next, right click OVER any part of the highlighted area and a dropdown menu will come up. 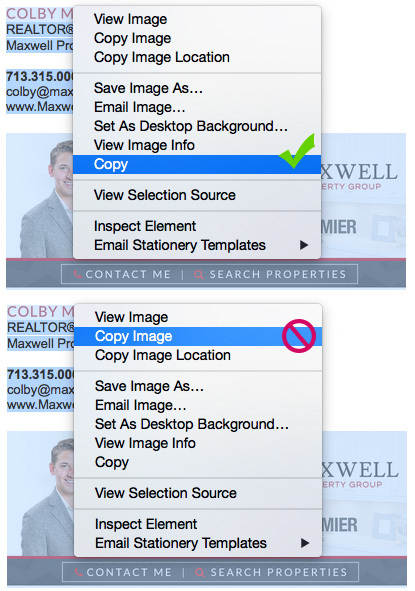 You’ll see two options: Copy and Copy Image. Please make sure that you select Copy to ensure that you copy the entirety of the signature that was selected, and do not select Copy Image as this will only copy the piece of the Signature in which you are currently hovered over.